← விஷ்ணுபுரம் விருது 2012. கோவைக்கு வருக! Tamil writer Nanjil Nadan, who captured the life and culture of the people of Nanjil Nadu, the ancient Tamil region in Kanyakumari district, has been selected for The Iyal Award instituted by a Canada-based Tamil Literary Garden. The award to be presented to him in Toronto on June 13, comprises a shield and 2,500 Canadian dollars. 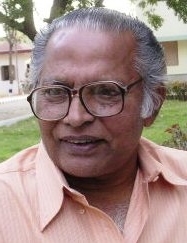 A winner of the Sahitya Akademi award in 2010 for his short story collection Soodiya Poo Soodarka , Nanjil Nadan left his native soil for Mumbai and spent a considerable part of his life there and travelling across the country. But his writings vividly portrayed the people, their joys and sorrows, pretensions, hypocrisies in an authentic language. “Though awards do not excite me, I deem them as a recognition and the ‘Iyal’ award will place me on a par with great Tamil writers and researchers, critics such as Sundara Ramasamy, Venkatswaminathan, S. Ponnudurai, Iravatham Mahadevan, George L Hart, Ambai, Kovai Gnani, Lakshmi Homstrong and S. Ramakrishnan, who are previous winners of the same award,” Mr. Nanjil Nadan told The Hindu . 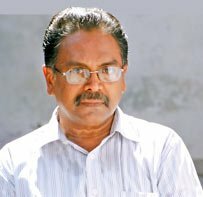 He said the award function would give him an opportunity to meet Sri Lankan writer A. Muthulingam, secretary of the Tamil Literary Garden and other Sri Lankan Tamil writers. படத்தொகுப்பு | This entry was posted in அனைத்தும், நாஞ்சில் நாடனுக்கு பாராட்டு விழா, நாஞ்சில்நாடனைப் பற்றி and tagged நாஞ்சில் நாடன், நாஞ்சில்நாடனைப் பற்றி, நாஞ்சில்நாடன், naanjilnadan, nanjilnadan, sisulthan, Tamil Literary Garden, The Iyal Award. Bookmark the permalink. It’s nice to see this info in the otherwise stale “The Hindu”. A question: why do they write as “Tamil writer Nanjil Nadan, ** who captured ** the life and culture of the people of Nanjil Nadu, the ancient Tamil region in Kanyakumari district” <<< – why is it captured as if it is in the past..? He is not done doing it yet!! I sure hope at least… shouldn't it be "who captures'’..?